The blog hop and our giveaway for a World Sampler pack from Mighty Leaf Tea and a Brew Cup ends tonight (4/29) at 11:59 pm EDT. In addition, Mighty Leaf Tea is running their own giveaway where the grand prize includes a year of their tea, with five runner up prizes of a $100 gift card for more tea from Mighty Leaf. My wife is the big tea drinker in this house and she got to try out the World Sampler pack from Mighty Leaf Tea. It includes three boxes of 15 whole leaf pouches each. On the plus side, the Ginger Twist provided a very relaxing cup of Indian tea with a nice ginger taste complimented by lemongrass and licorice. The White Orchard cup was a typical Chinese white tea with hints of melon and peach. The organic detox variety was not a favorite with too strong a basil mint infusion. All provided a strong aroma that would draw anyone into the kitchen, including the dog, to see what's brewing. The tea pouch requires special mentioning in the review here. Mighty Leaf calls their tea pouches artisan. The pouches are hand stitched with unbleached cotton without using glue or staples. They've even won awards for green packaging. Keep to using them only once with filtered/bottled water for best results. Personally, I'm more impressed with the Brew Cup that came along with the tea. It has an especially slotted top for slipping the tea tag through and then brewing your tea on the go. Once brewed, you just pull the tag up and the tea pouch tucks away into the top of the brew cup, allowing you to not over brew the tea. The shame of that ever happening. The sampler pack of tea itself sells for $30. The mug on its own goes for $17. At $10 per box of 15, prices are not that unreasonable. It certainly isn't priced as low as Lipton, but higher priced teas are becoming more the norm when heading out for dinner. 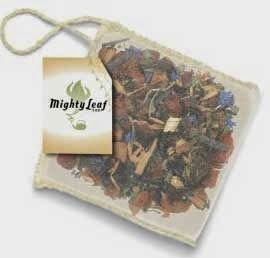 If you like brewing with loose tea but don't like the fuss, the whole leaf tea pouches from Mighty Leaf could be just what you are after. Here's the giveaway form again for those who haven't entered yet. Ends at 11:59pm EDT on 4/29/14. Continental US only.